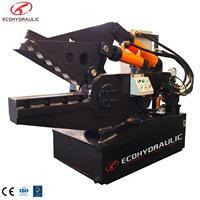 The most experienced manufacturer of metal recycling equipment… Jiangyin Metallurgy Hydraulic Machinery factory (brand name : ECOHYDRAULIC) was originally set up in 1989 to manufacture and market briquetting press, metal balers, alligator shears, metal shears and other non ferrous scrap processing equipment. During the last three decades we have installed over 3000 systems , build the entire quality controlling standards and cultivated an experienced technique & after sales team. Why ECOHYDRAULIC? Since 1987, the ECOHYDRAULIC brand has been a trusted name in domestic metal recycling with commitment to economic value, sustainability, safety and customer satisfaction. Our product covered all states in China and over 23 countries including USA, Japan, Russia, Europe, South Asia and Middle East. Currently, we have two plants over 12000 square meters. There are more than 80 staff members, 12 professionals among them. We build over 200 machines annually. And now, proudly, we clearly build our vision : grow up with our customers. And our mission : the most professional ,economic,reliable supplier in the industry. In 2016 We set up a new company and brand, Derby Machiney LLC ,under Jiangyin Hydraulic , to take a deeper step into the global market. Derby Machinery is devoted to offer customer worldwide very economic and mature solutions with experienced Jiangyin Hydraulic accumulated in brutal domestic market. Progressive, persistence, practical, innovation and always to be first. Ideas guiding thought, thinking promote innovation, quality build brand, efficiency improve speed, science create perfection. The satisfaction of customer (user) are products’ standards. Customer satisfaction of customer (user) are products’ standards.